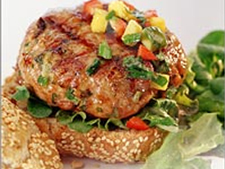 Great flavour, light & colourful and a great alternative to beef burgers. Mix the burger ingredients together. Shape into 4 burgers. Barbecue until fully cooked, 7- 8 mins. on each side. Mix the salsa ingredients together. Serve with the burger, bap and salad leaves.